When my husband and I are able to take a vacation, we love going somewhere warm by the ocean. Since we live in the mid-west, this is something that we don't get to do very often. So in between vacations, I recreate those memories through stamping. Here are my current favorites. I love doing the sponging technique to create the blue/green hues of the ocean, and the yellow and purple sky of a setting sun. Thanks to all of you that post your great creations as they definitely inspire my creativity. The thing that I like most is that every card turns out a little different. The cards below were made for a couple of my friends that needed a little pick me up. I also think these designs would be great for sympathy cards and for the guys in your life. The version with the lighthouse was made for my brother's birthday. 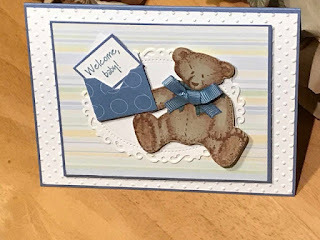 Before stamping or sponging, make sure your card stock is cut to the finished size. When I made these cards I trimmed after and lost the really cool edging the sponging makes. For the masking, I found post-it notes that have a large sticky area. This made masking so much easier. They are made by Post-it and called full adhesive notes. When stamping the lighthouse, be aware of the shadow that is created by layering the two stamps together. Just make sure you place the light source on left. I am still amazed how these turned out! Both cards started out completely white, Give this a try. I hope you have as much fun as I do making these cards. I love the birds on the water. Can you tell me what colors you sponged on? I'd also like to know the colors you used. What beautiful cards! For the water I started with the light colors of blue (most are retired from Stampin Up but you should be able to find something close) Bashful Blue, Bordering blue and little Ballet Blue. The lighhouse card, I used Night of Navy for the waves. The sunset is a combination of Summer Sun, Pumpkin Pie, Perfect Plum and Night of Navy. Again, I started with the lighter colors first adding the darker colors until I go the right look. I'm so glad you liked my cards! Give them a try - easier than they look. These are gorgeous. Thank you for sharing them. Thank you ever so much. I moved and am only now able to get to stamping.you are amazing.